Globally, the demand for natural gas liquids (NGL) has been rising in response to their increasing use in petrochemical applications. NGLs such as butane, ethane, propane, and isobutene are used as feedstocks in the petrochemical industry. This has proven crucial in boosting prospects for the sale of natural gas liquids globally. Despite the decreasing cost of natural gas, Transparency Market Research (TMR) projects the cost of natural gas liquids to remain comparatively higher through the forecast period from 2016 to 2024. On the flip side, the market faces challenge from the declining prices of crude oil, due to which naphtha, a petroleum by-product, is replacing ethane in petrochemical applications. However, the price of crude oil is expected to normalize in the next few years, thus boosting prospects for natural gas liquids. During the same time, prices of natural gas are likely to fall. This declining trend of natural gas prices is likely to continue through the forecast period between 2016 and 2024. Lower price of natural gas as a result of weak demand, will in turn bolster sales of natural gas liquids. Transparency Market Research forecasts the global natural gas liquids market to expand at a CAGR of 7.16% by volume between 2016 and 2024. In 2015, the market stood at 7,982.63 kilo barrels/day and is expected to reach 14,806.59 kilo barrels/day by the end of 2024. Regionally, North America and the Middle East emerged as the most attractive markets for natural gas liquid in 2015. While the Middle East held the largest share in the overall market in 2015, North America is poised to surge at the fastest CAGR during the forecast period. The Middle East presently accounts for 40% of the proven natural gas reserves globally. The rapid industrialization witnessed in Saudi Arabia, Qatar, Iran, and the UAE has proven quite benefitting for the prospects of the natural gas liquids market in the region. Among these countries, Qatar held the distinction as the highest producer of natural gas liquids in the Middle East in 2014. The Middle East NGL market stood at 2,909.2 kilo barrels/day in 2014 and is expected to reach 5,468.9 kilo barrels/day by the end of 2024. In North America, the U.S. and Canada emerged as the largest producers of natural gas liquids in 2014. The U.S. is presently witnessing shale gas boom due to which the production of natural gas has significantly increased in the country. Residential heating and petrochemical industries have emerged as the key application segments of natural gas liquid in the U.S. In Canada, sale and production of natural gas liquids are encouraged by the presence of established infrastructure. Asia Pacific is also constantly increasing in its production and processing capacity of natural gas. Some of the leading markets for natural gas liquids in Asia Pacific include India, Australia, China, and Indonesia. By type, ethane, propane, normal butane, pentanes plus, and isobutene constitute the key product segments in the natural gas liquids market. Of these, ethane held the dominant share of 45% in the market in 2014. The shale revolution witnessed in the U.S. has triggered paradigm shift in the global natural gas liquids market. This established the U.S. as a leading exporter of ethane in the global market. Increasing application of ethane in the petrochemicals industry also aided growth of this product segment. Propane is another widely used constituent of natural gas liquids. It is increasingly gaining prominence as a green fuel across residential, commercial, industrial, transportation, and chemical and refinery sectors. By application however the petrochemical industries segment accounted for 55% of the global NSL market in 2014, followed by the space heating segment. Some of the leading companies operating in the global natural gas liquids market include Exxon Mobil Corporation, Chesapeake Energy Corporation, BP Plc, Range Resources Corporation, Royal Dutch Shell Plc., and others. The natural gas Liquids market report by Transparency Market Research provides in-depth analysis of the natural gas Liquids market globally. The report segments the market on the basis of type and geography. The report analyzes the global natural gas Liquids market in terms of production (Kilo barrels/day) for the 2016–2024 period. For this research study, the base year is 2015, whereas the forecast is from 2016 to 2024. The report provides a comprehensive competitive landscape and features companies producing and processing natural gas liquids. This report includes the key market dynamics affecting the natural gas Liquids market globally. The analysis in the report provides detailed insights into the global natural gas Liquids market. Major dynamics such as drivers, opportunities, and restraints of the market were analyzed in detail and are illustrated in the report through tables. The report also provides a detailed industry analysis of the global natural gas Liquids market with the help of Porter’s Five Forces model. The natural gas Liquids market has been segmented on the basis of type into ethane, propane, normal butane, isobutane, and pentanes plus. Ethane was the largest type segment of the natural gas Liquids market globally, accounting for more than 45% of the global share, in 2015. Sales of ethane increased due to its growing applications across the globe. Propane was the second-largest type segment accounting for more than 20% of the global share, and Isobutane was the smallest type segment of the natural gas Liquids market globally, accounting for less than 10%, in 2015. Isobutane was the smallest type segment owing to its limited applications and market value. The global natural gas Liquids market growth is anticipated to be hampered by increasing use of alternatives such as naphtha. The natural gas Liquids market was analyzed for North America, Europe, Asia Pacific, Middle East, Africa, and Latin America. The Middle East had the largest production of natural gas liquids, followed by North America and Europe. The market for natural gas liquid in the Middle East accounted for more than 35% of global market share in 2015, whereas the market in North America stood at around 30%. The U.S., Saudi Arabia, Qatar, Canada, and he UAE were the leading countries in these regions with respect to natural gas liquids production. Europe, Africa, Latin America, and Asia Pacific also had significant natural gas liquids production in 2015. Europe held around 10% market share of the global natural gas Liquids market, while Asia Pacific, Africa, and Latin America accounted for less than 10% of the global market share in 2015. These regions are expected to increase natural gas liquids production during the forecast period owing to rising demand and growing investments in natural gas liquid production and processing infrastructure. 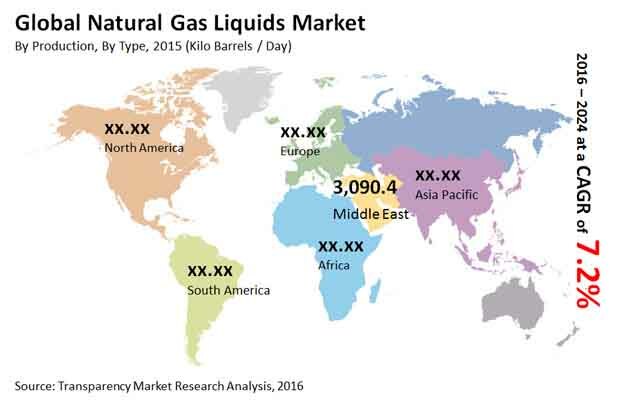 Some of the key market participants in the natural gas Liquids market include BP Plc, Chesapeake Energy Corporation, ConocoPhillips Company, Exxon Mobil Corporation, Linn Energy LLC, Range Resources Corporation, Royal Dutch Shell Plc., SM Energy, Statoil ASA, and Swift Energy Company. The report provides an overview of these companies, followed by their financial details (if available), business strategies, and recent developments.